Not only does The Secret World feature an epic story, class and level-free character development, and big production values, it also has zombie-philiac monsters. It's been a while since we heard about The Secret World, Funcom's new MMO. The game's been generating a lot of buzz, particularly since the developer has been relatively quiet about it for quite some time. However, that's all about to change, as the game is on display at PAX Prime, and there's a lot of new information available. Funcom's hands-off demo showcased how unique the gameplay is in The Secret World. Basically, the game doesn't feature classes or levels. Instead, character development is described as being "both horizontal and vertical." The vertical progress is delivered via various items and equipment, which will boost character stats. Horizontal progress, in turn, comes via "anima wells", which allow players to learn and assign new skills to their character. It turns out that there are over 500 different abilities available via the anima well, all of which can be learned by a single character. Ability-switching can take place in the middle of dungeon missions, as was shown during the demo. The main player-character started off as a melee fighter, armed with a sledgehammer. This worked just fine for a while as the player party progressed through an outdoor dungeon to investigate why the Draug were invading the sleepy New England town of Kingsmouth. During the first portions of the dungeons, Draug and zombies were the typical enemies, and they were pretty easy to get up and personal with. Now, a side note: Zombies always hang out with the Draug, and it's for all the wrong reasons. It turns out the Draug are based on the Draugr, undead monsters from Norse mythology. In The Secret World's mythology, the Draug use zombies for breeding purposes, as they implant their spawn into the corpses of those they kill. The dead then bring the Draug spawn to term and give birth to them in truly unpleasant ways. As the dungeon progressed, pregnant zombies started becoming a regular part of the enemy forces players were battling. Back on topic: During a boss battle that didn't provide players the opportunity to get close enough to hit the monster with a hammer, it was demonstrated that players could switch their skill wheel so that they could use firearms and special ranged combat attacks instead. After the final battle against a "Primordial Dweller" (a giant figure that looks like a combination of a jellyfish, an elephant, and Cthulhu), the characters were evacuated on a helicopter that was subsequently attacked by a dragon before things cut to black. It was also explained that there will be out-of-game tie-ins that will affect gameplay. 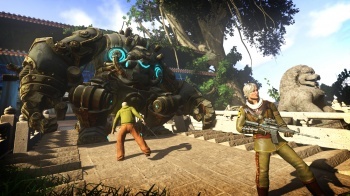 Players can access websites for the fictional companies in The Secret World that will provide clues or codes that can be used to find and unlock items within the game. The Secret World is easily the most ambitious thing that Funcom's tackled. That's saying something, seeing as this is the company that brought us games like Anarchy Online, The Longest Journey and Age of Conan. A huge part of this ambition is based not just on the story within the game, but how it's actually told. You see, there are three different factions in The Secret World: the Illuminati, the Templars, and the Dragon. The Illuminati believe that morality is totally outdated and needs to be re-written, using its unique blend of technology and magic. The Templars, in turn, are the righteous defenders of tradition, defending what they believe is right with the passion of a thousand generations of service. The Dragon, meanwhile, believe that major events are all kicked off with minor events (essentially, the whole butterfly-causing-a-hurricane theory) and seeks to put its agent in the right place at the right time, resulting in massive change. Each of these secret societies has specific beliefs about how the world should work, and they're all engaged in something called the Secret War to try and take control of humanity. During the demo, one of the missions on display followed an Illuminati agent going into a parking garage to meet a contact, only the lights were out and the structure was filled with monsters who used to be people. It was explained that each faction will provide missions based around the same story events, but they'll be significantly different: The Templars would be responsible for turning off all the lights, but the Dragon agents would arrive when everyone was still human (it was implied that they'd be responsible for turning the population into inhuman creatures). The Secret War also manifests in PvP events, based around taking control of certain mystic power points across the globe. Three of these locations were revealed to be Shambhala , Stonehenge, and El Dorado. As a faction grabs hold of these areas, all the players under that banner (across the entire server) will receive a bonus of some sort for as long as this control is maintained. Based on what was on display today, The Secret World looks great. The game is powered via the same engine as Age of Conan, though it's received a pretty substantial upgrade. The environments are incredibly detailed, character animation was great, and the enemies featured some amazing design. Additionally, there was a lot of quality voice-acting present in the demo. The Secret World is due out in April 2012 for PC.